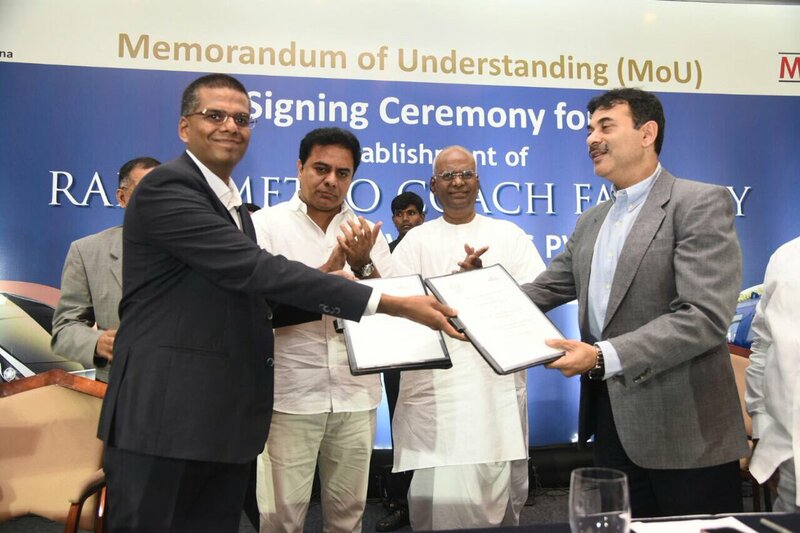 Hyderabad: The Telangana Government allotted 100 acre land for an upcoming rail & metro coach factory, with an estimated investment of Rs 800 crores (approx US$ 123 Million). 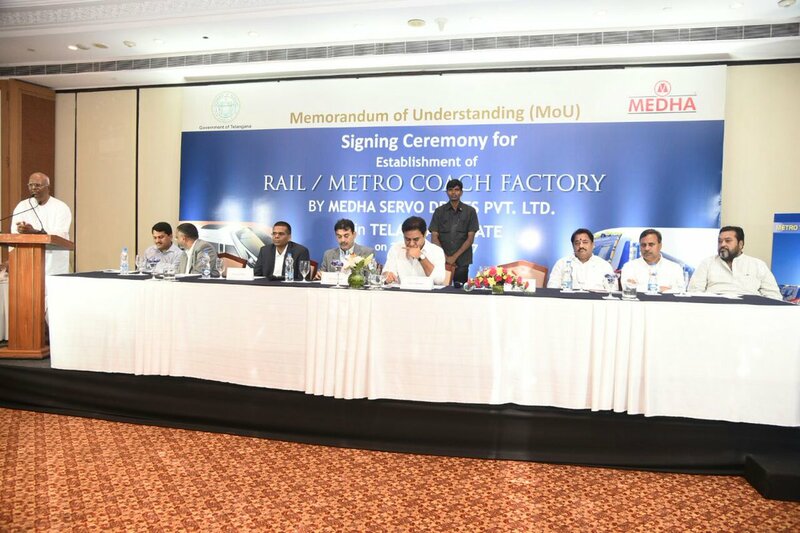 The upcoming rail & metro coach factory proposed to be set up by Hyderabad-based Medha Servo Drives Private Limited. 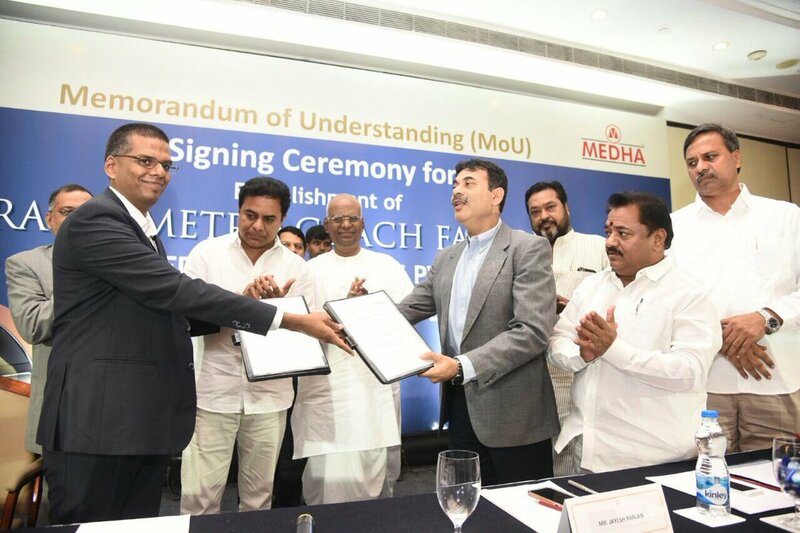 Telangana has signed a memorandum of understanding (MoU) with Medha Servo on Friday for the rail and metro coach manufacturing facility. 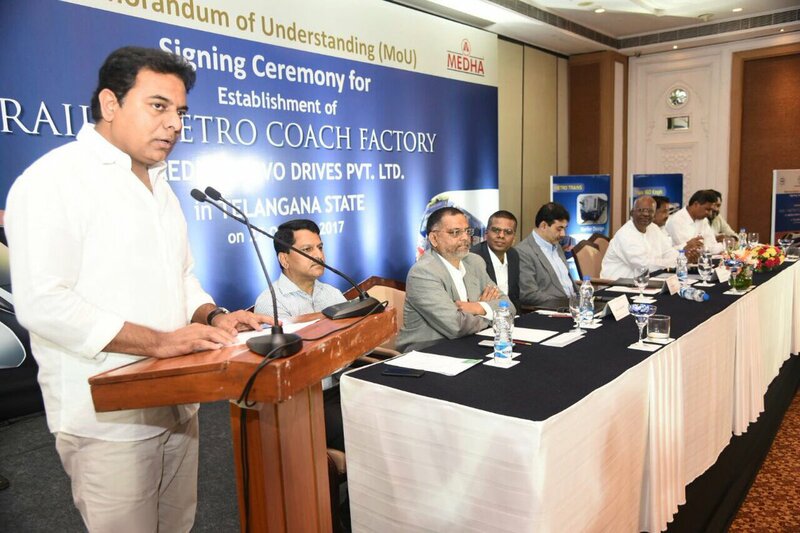 Minister for Industries K.T Rama Rao attended MoU signing ceremony with Medha Servo Drives at Hyderabad. “Though Telangana was promised a Rail Coach Factory within six months of its formation in the Andhra Pradesh State Reorganisation Act 2014, it has never become a reality in spite of frequent appeals to the central government,” KT Rama Rao said. Medha Servo Drives is the largest propulsion equipment supplier to Indian Railways (IR) that will be setting up Rail or Metro Coach Factory. Around 100 acres of land has been allocated through TSIIC at Kondakal to Medha Servo Drives Rail/Metro Coach Factory. Medha will work with Telangana Academy for Skill and Knowledge to train the required manpower for the upcoming factory. Medha Servo Drives Pvt. Ltd. was incorporated in 1984 at Hyderabad, has diversified into Railways in 1990. Medha is a group of five companies, with total employment strength of around 3000 and with a turnover of 1000+ Crores. Medha is the largest Propulsion equipment (Electronics) supplier to Indian Railways. Medha is the only Indian company which has in-house R&D facilities and developed its products which were otherwise supplied by multinationals like ABB, Alstom, Bombardier, Caterpillar, GE, Hitachi, Mitsubishi, Siemens, Toshiba, etc. By supplying products designed and manufactured by Indian engineers meeting international standards, Medha has become a trusted partner of Indian Railways. Medha, in its ambition to grow internationally, has recently opened its first overseas sales office in Dallas, USA. In Kolkata Metro project, Medha has handheld ICF (Integral Coach Factory, Chennai) for a new design of train and for car body manufacturing. Now Medha is working with ICF to deliver a 160 kmph train design which will be the first trainset capable of running at 160 kmph in Indian Railways.